All three groups set out from the Eustagia way parking. A short uphill on the brick paved road took us down to the beach and we the proceeded onto Llandudno beach. 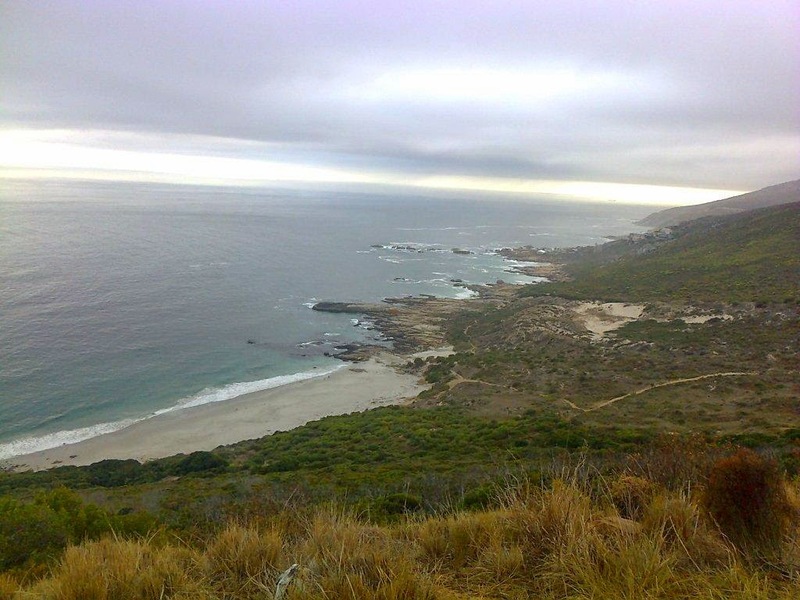 From here, each group ran their own distance along the beach before backtracking to Sandy Bay to enjoy the views. 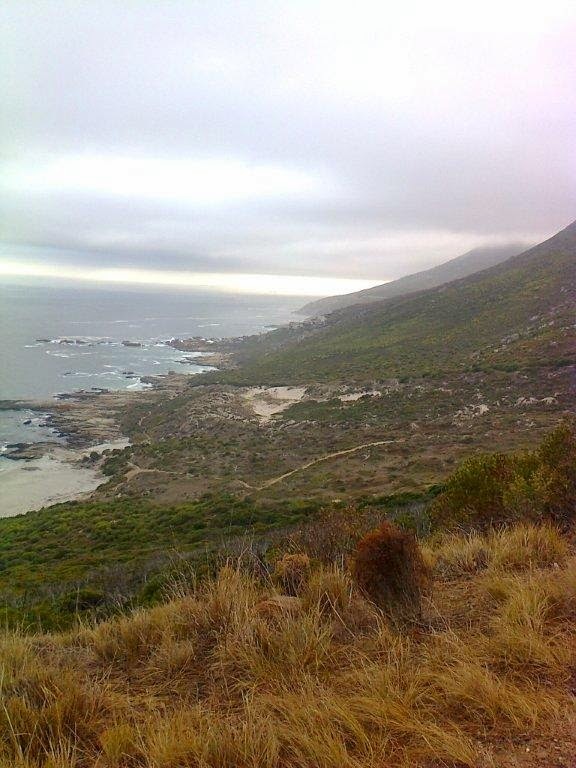 All groups then headed southwards along the shoreline to Oude Schip followed by a climb up gabion steps to Rocket (Mitchells) Road taking the left fork at the stone cairn. The main group completed 12km in 2hrs. Sun rise over the Peninsula. Another large group of runners turned out on this misty morning. All three groups started from the Constantia Nek parking and went up the first shortcut. From here, we went around the corner up the side of the mountain. 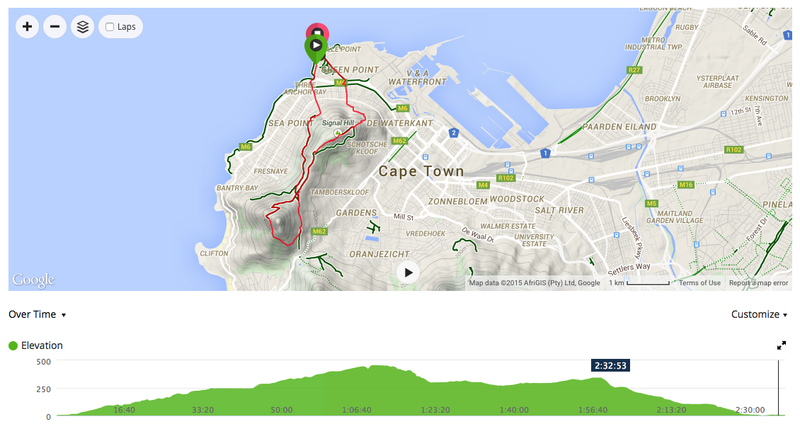 This route, Constantia Corner, is a tough route with a lot of up and some sections of climbing. Half way up the fist shortcut. 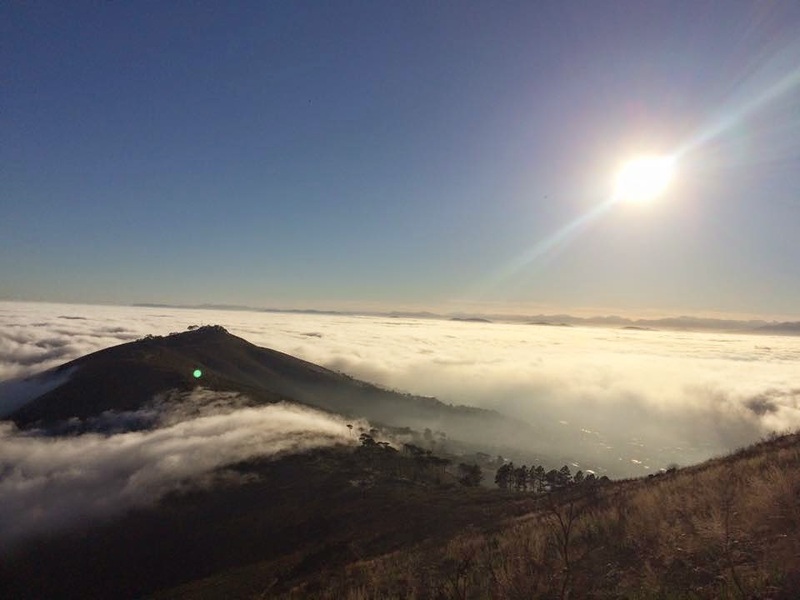 The mist over the valley and all the way into Hout Bay. Somewhere on the Constantia Corner, looking south towards Constantiaberg Peak. And we just continue up, at least the sky has cleared (slightly). We finally reached the plateau and were greeted by some flowers, sunshine and 'camel rock'. At this point, we were close to De Villiers dam. Some flowers to brighten the day. 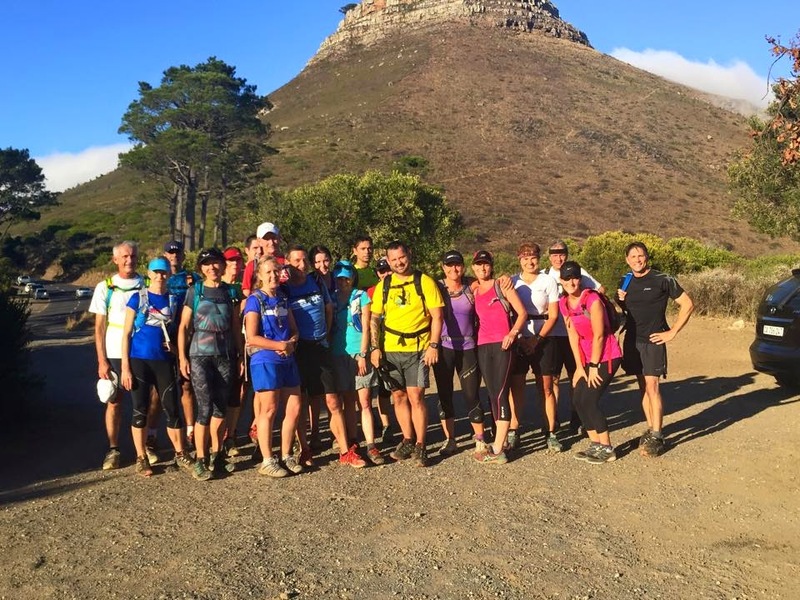 Recovery group on the plateau behind De Villiers dam. 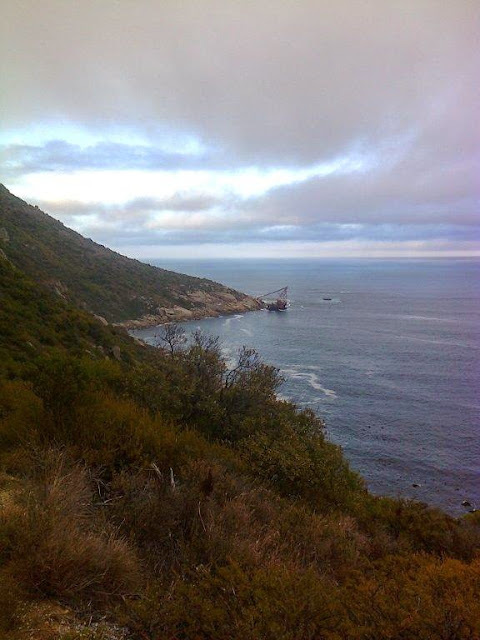 From De Villiers dam the three groups went their separate ways. 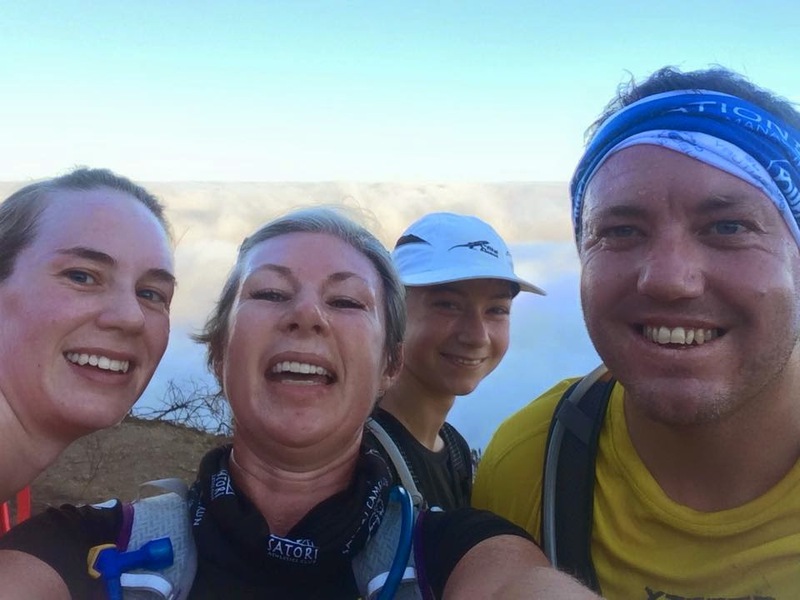 The main group continued along the concrete road and did a loop to Helly Hutchinson dam before returning to De Villiers dam and along Cecelia ridge. The Recovery group headed directly down Cecelia Ridge. The walk/run group proceeded directly down the concrete path back to the start. The route down Cecelia Ridge was very steep, but the waterfall was worth the view. The last section was along the contour path back to the start. Views along the contour path. The main group completed 12km in 3hrs, the recovery group completed 8km in 3hrs and the walk/run group come back in about 2hr30min. We had a bumper turnout of 54 with lots of newbies and some racing snakes so quite a mixed bag today! Sun rise, best time of the day! 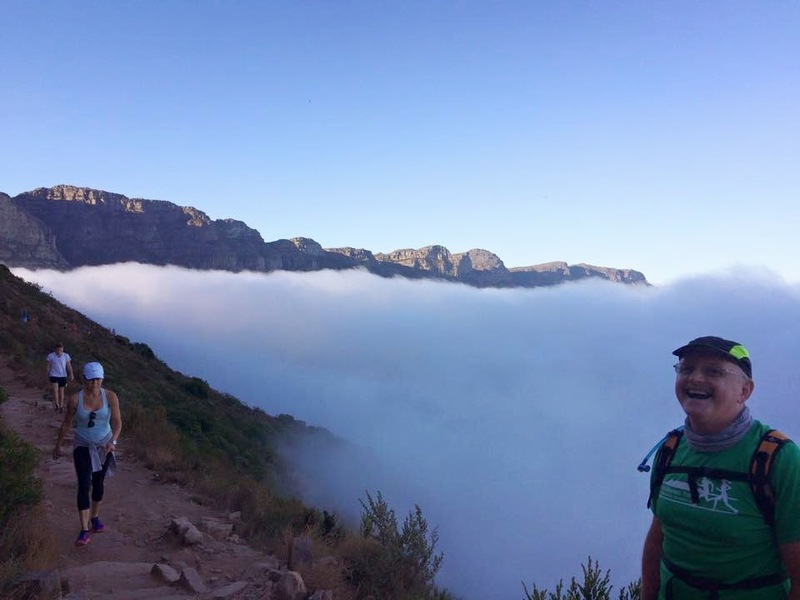 Starting with a hard slog up Kloof Corner with its bazillions of steps is a toughie but we were rewarded with views of a beautiful sunrise and pink skies over blue sea. 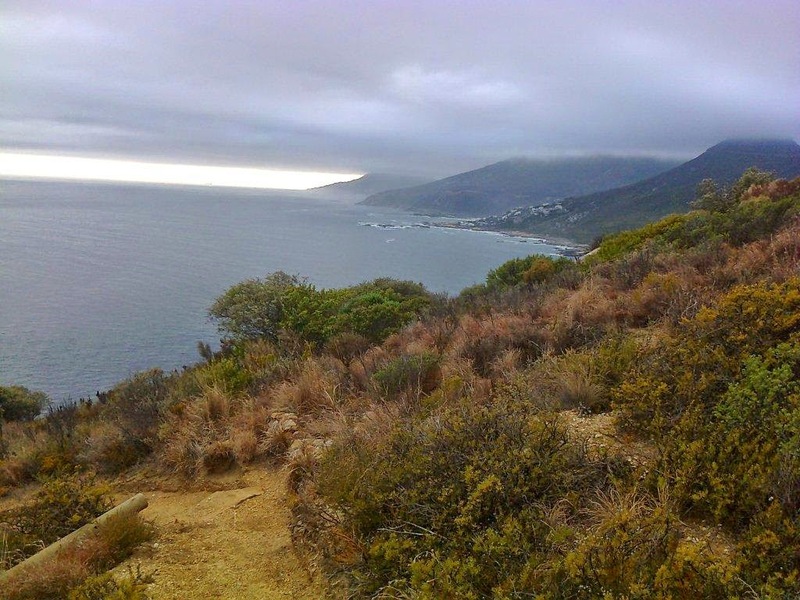 Then arguably some of the best singletrack in Cape Town, the top contour path winds its way around the mountain with spectacular views of Lions Head, the city and sea. Undulating is a bit of an understatement as following the Devils Peak path up to the Saddle is another hard slog on already tired legs. 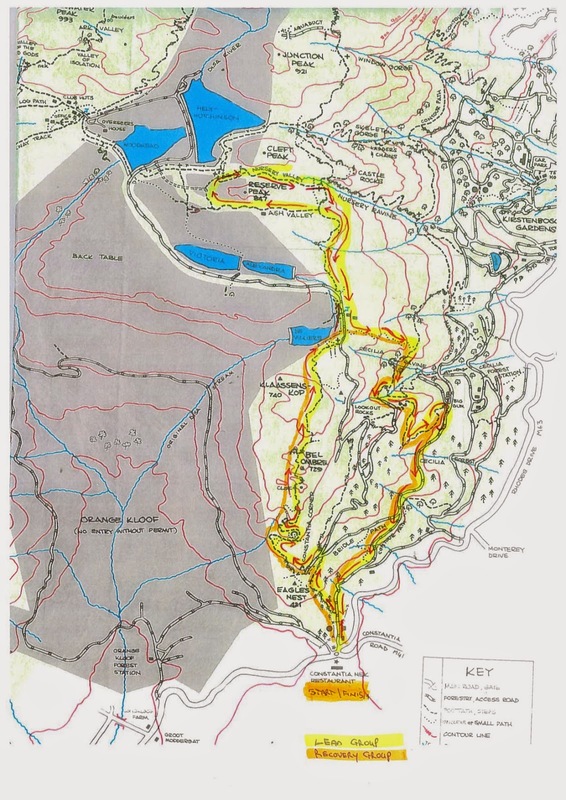 We changed our route slightly and instead of turning onto the Oppelskop path we followed the Blockhouse path for a while, looping back to connect with the Oppelskop path and lower contour home. The speedy front runners ran the contour path all the way back to where we started at Kloof Corner and ran about 16kms in under 3 hours. 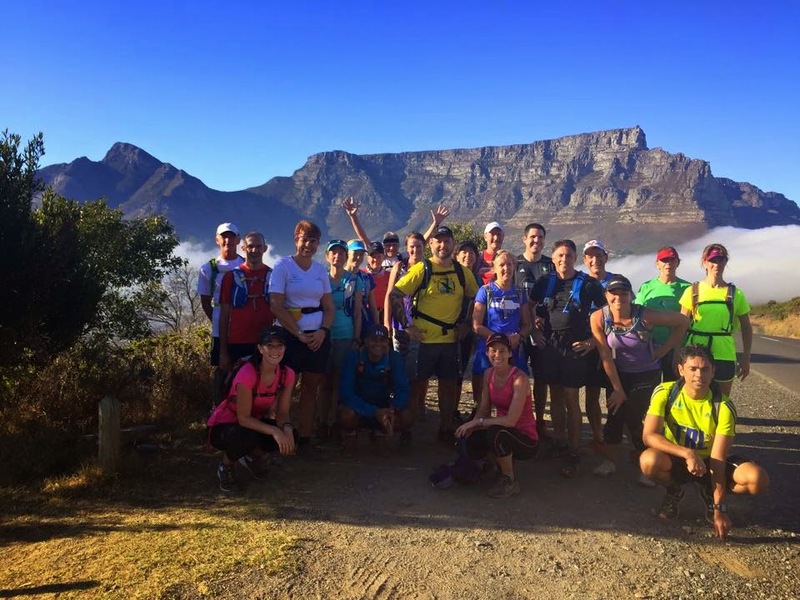 The more sensible back runners took the shortcut down the path under the cableway and ran approximately 14.5km, a few ran down to Tafelberg rd and stretched their legs on the t*r home. Silhouette of the recovery group under an overhang. We only had one mishap in that a newbie fell and hurt his back but was able to walk home and said he would run with us again, so we are hoping it is not too serious. Nobody got lost which was quite an achievement for such a large turnout. The relay system of leaving a front runner at every turn till the back runners caught up worked well and taking it in turns meant the same person did not have to wait every time. With the exception of Geoff who became the unofficial main group sweep. Thank you Geoff! Thank you to Julian for leading the main group and Gae for sweeping and looking after newbies. Recovery group taking a quick break. The Recovery group had a lovely 10km run in 2hrs 10 and the Run/Walk group had an enjoyable outing of 8.75km in 2h20. Thank you to Randolph for leading Recovery and Peter for leading Walk/Run. Congratulations to Felicity Garbers who completed her 75th sortie earning her the right to wear the Blue TMT T-shirt! 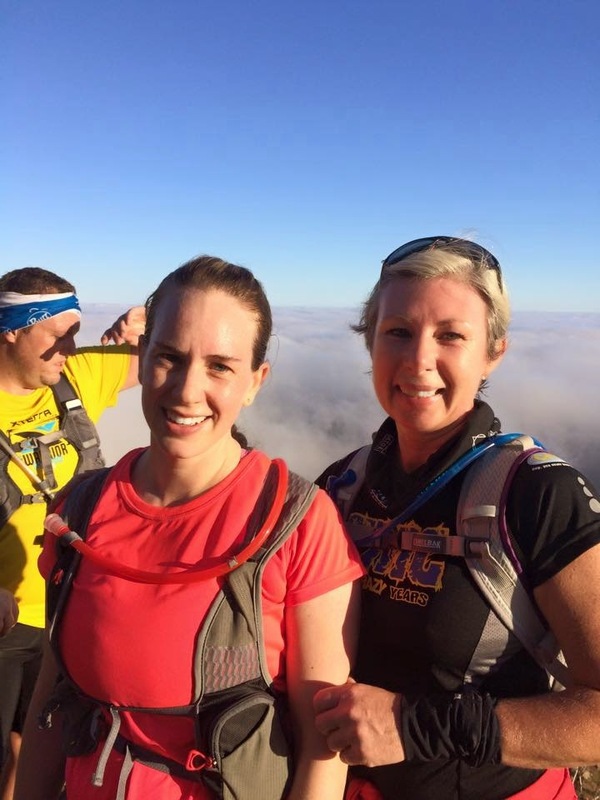 Up dating the master register I see that Melanie Martin an old trailer who took off time to have a baby girl returned yesterday and competed her 10th sortie and so did Teri Smith despite her dislike of precipitous trails. Both move up to the Speed check-in part of the Start Register. On a cold and misty Saturday morning, a few trail runners met at the Mouille Point lighthouse in Seapoint. All three groups set out along the road and up Glengariff road to the base of Signal Hill. A nice and easy, undulating route led up to the side of Signal Hill towards Lion's Head. 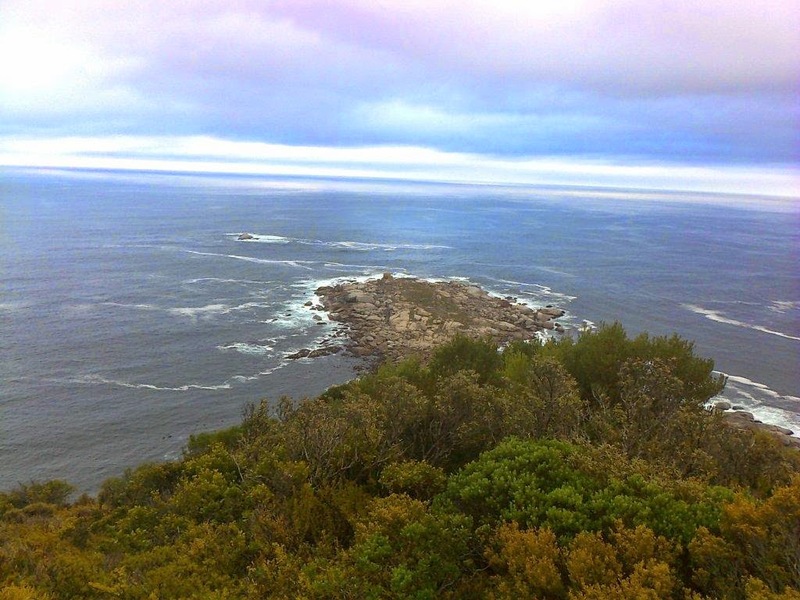 Misty morning at Mouille Point lighthouse. Burnt trees and misty mornings. 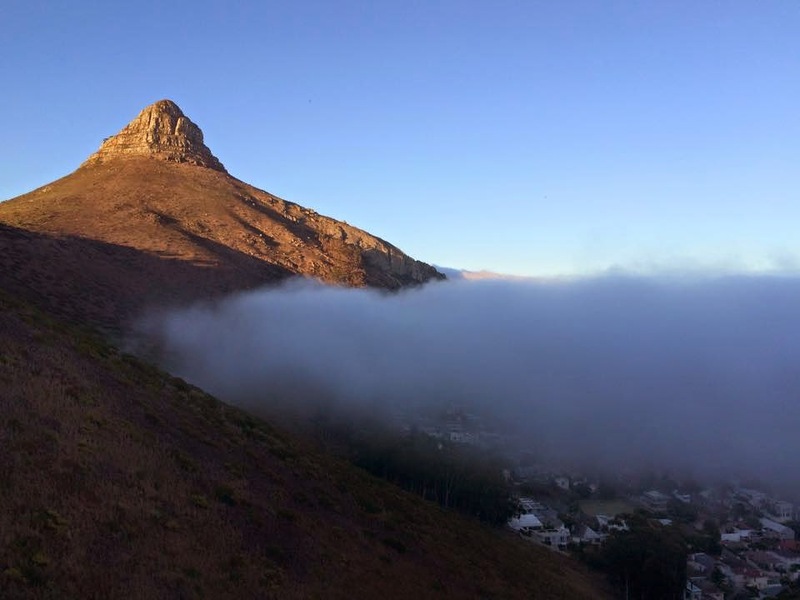 Lion's Head peaking up over the clouds. 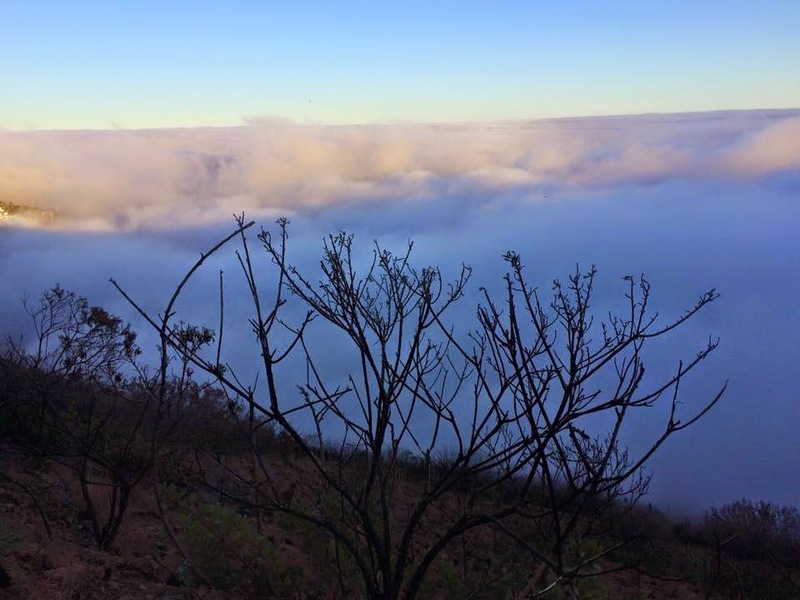 The Bay covered in fog. Selfies while they wait for the rest of the group. Main group on the slopes of Signal Hill. Look who has made a come back! 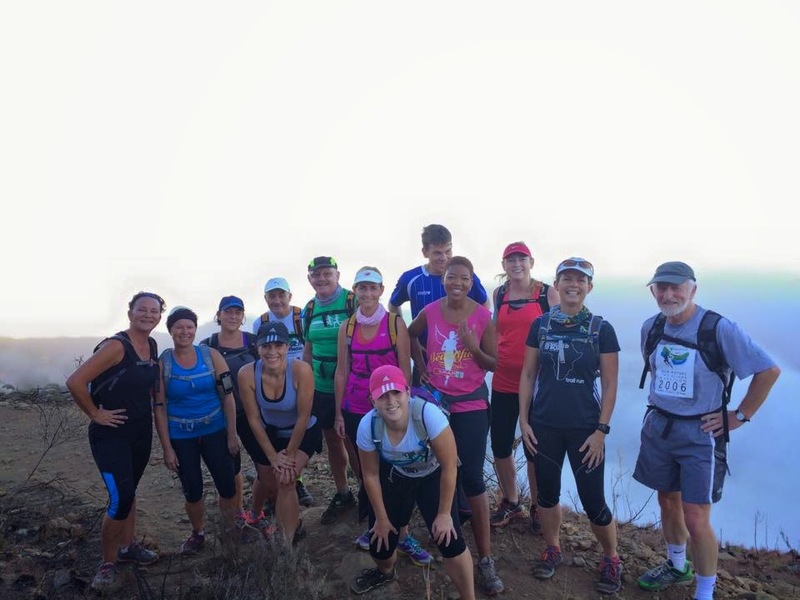 The Recovery group on the slopes of Signal Hill. The Recovery group takes a plunge off the mountain. The Main group with TM in the back. From here, the three groups split up. The Walk/Run group headed back towards Sea Point above the gun battery and via the Urban Park. 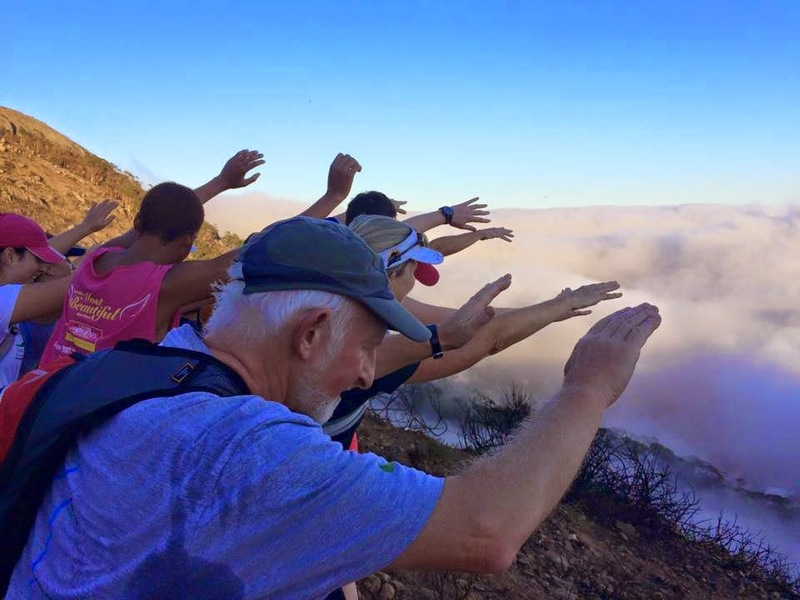 The Recovery group did an anti-clockwise loop around the upper circular track of Lion's Head before going back to Sea Point. 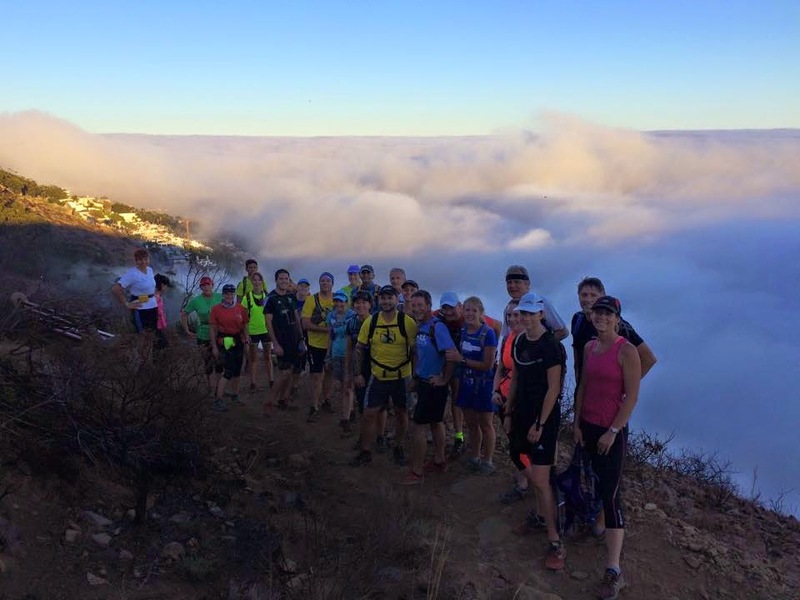 The Main group did a longer anti-clockwise run around the base of Lion's Head before heading back to Sea Point. The Main group completed 13.7 km with 330m elevation gain in 2h 10min and the Recovery group completed 12 km with 580m elevation gain in 2h 30min. Recovery group route and elevation.